Mixed Feelings Cooling Blonde Mixing Drops is rated 4.4 out of 5 by 14. 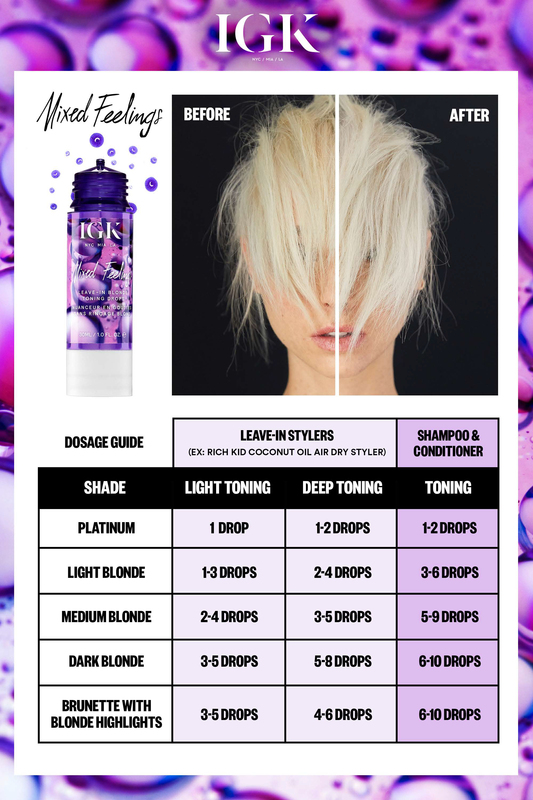 Harness the incredible beauty of blonde, silver, violet or brassy gold shades with IGK Hair Mixed Feelings Cooling Blonde Mixing Drops, a leave-in treatment created to embrace every lock’s true potential. These innovative drops are infused with prickly pear cactus extract which works to nourish hair from root to tip. This helps to make hair feel softer and appear shinier, while the concentrated purple pigment gets to work enhancing hair’s colour and shimmer. IGK Hair Mixed Feelings Cooling Blonde Mixing Drops should be added to a favourite styling product or leave-in conditioner, then blended in the palm of the hand to ensure the best coverage. The number of mixing drops needed depends upon the depth and tone of colour required. Between one and four drops should leave hair looking incredible and feeling fantastic. Indulge your hair with enhanced colour by enlisting the help of IGK Hair Mixed Feelings Cooling Blonde Mixing Drops, a dedicated leave-in solution that draws out the best from colour treatments. Mix with your styling products or leave-in conditioner, blending in the palm of your hand before applying to your hair. Apply 1-4 drops depending on the level of toning needed. Rated 5 out of 5 by Trishc from Love these! I bought these a month ago and really love the results! I love you can mix them with lots of different products and vary the amount you add to your conditioner. I have been using them with my leave in conditioner. Super impressed. Give a lovely cool colour. Will be purchasing again. Rated 5 out of 5 by anonymous me from great for highlighted hair I have thick dark blonde hair with highlights. My hair absorbs anything I put in it, which is why I cannot use violet shampoos and masks too much - thery dry out my hair and make it look furry. i add these drops every morning when styling and the highlights look beautiful now. I mix it with my primer, not my oil, and I even put it straight in on th edark blode sections to take off the reddishness in my pigment. owesome and bag friendly. Are you taking your viloet mask on a weekend away with you? neither do i - but I take this. Rated 4 out of 5 by Blinknsparkle from genius i think this product is a great concept. I tend to find purple product to be quite drying but now i can use my regular haircare and make it suitable for anti-brass therapy whenever needed. Has saved me so much space in my bathroom. Great work to whoever invented this. Also you need to keep it for quite a bit to have an effect. Rated 5 out of 5 by cemjay23 from GENIUS This is such a handy product! You can use your regular preferred favourite shampoos and conditioning products but still neutralised brassy tones in your hair! You can customise the strength of toning by how many drops you use! Genius! I use 2-3 drops for most washes (and some extra in my leave in conditioner) and then 3/4 after I’ve used a home dye! The 30ml seems small for the price but it lasts for absolutely ages!! Great product.